Today I’m looking for some of the best immersion blenders on the market - if you’re interested, take a look to find out all that you need to know about them. I hate taking out a mixer whenever I have to make a cake or some cookies. It’s huge, it takes a long while to set up, and I just want to get it over with as soon as possible. It’s especially bad when I just need something done quickly. I wanted to make a puree the other day, for lunch, but it was kind of last-minute, and I just couldn’t be bothered so - no puree for lunch! That’s where an immersion blender comes in handy. I can have stuff whipped or emulsified easily, and I don’t have to deal with a lengthy setup process. Mine is currently broken but I’m actively looking for a new one, and today I’ll share my most recent findings with you! Join me in the search for the best immersion blender on the market. When you hear about an ‘immersion blender’ it might sound a bit complicated and technical. Don’t worry; I can assure you it’s just as simple as most other household devices! These devices are also called ‘hand blenders’ – because you use them by hand – or ‘stick blenders’ – because they look like sticks. Now they sound much simpler, don’t they? They don’t look a lot like regular blenders or food processors at all and are more akin to mixers. However, they’re far less cumbersome than usual stand mixers that you might own. 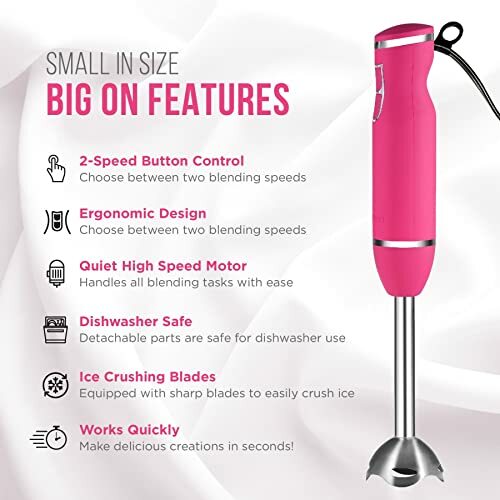 They consist of a motor inside a thick handle, which also has the control buttons on it, and an extended part used for mixing that can be customized with different attachments. You can use them for anything – from frothing milk to crushing frozen fruit. If you’re having trouble blending frozen fruit, we made a list of the best frozen fruit blenders on the market that you can check out right now! As for their purpose – they’re somewhere in-between a normal blender and a mixer. They’re great at crushing stuff into a fine paste. This makes them ideal for making soups, purees, smoothies, whipped cream and more. Why would you use them over a food processor or a mixer? Well, it’s simple – they’re more convenient and better at some jobs than either of those two tools. They spend less energy and take up less space while slicing food easier than a knife. If you’ve never bought an immersion blender before you might be in a for a bit of a problem. It’s not the same as buying a food processor or a regular mixer. Here, I’ll help you deal with it and give you some tips on how to find the best immersion blender for you. I find that the first thing I look for in an immersion blender is what it can do — not much point in buying it if it’s a severely limited machine. So, the first things I look at are the settings they have and the attachments that come with the blender. If you’ve got the right attachments, you can do almost anything with one of these babies. Mashed potatoes anyone? Maybe a smoothie? Making smoothies is almost an art, and you need the right tool for the job. Take a look at what we think are the best blenders for making green smoothies, and you might just find the tool you need. Of course, the settings are important as well – you don’t want to be stuck on having just one speed. If you can adjust it just right, you can use it on more sensitive foods that usually require hand-mixing. 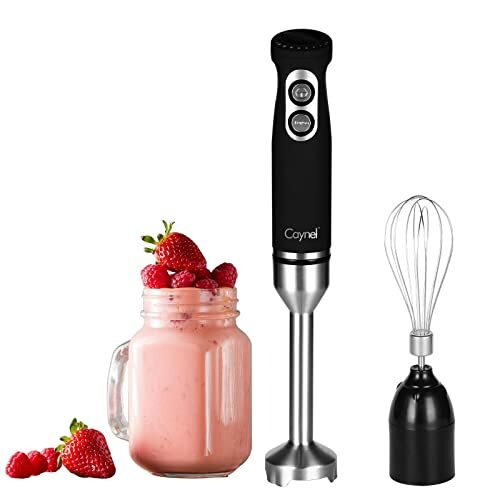 I want to reduce the number of appliances I need to have, and if you’re the same, you’ll also be looking for an immersion blender that can do almost anything. While it’s not the most important thing, a strong motor is a good thing to have in an immersion blender. You don’t want it to be underpowered - if it is, there’s nothing you can do with it, no matter which settings and attachments you might have. However, you also don’t want it to be stronger than you need it to be. Stronger isn’t always better since it will spend a lot more power without providing a lot of benefits. Try to balance it out and get something in the 200 to 500-watt range. While the main benefit of immersion blenders is their ease of use, not all of them are that convenient. Some immersion blenders are cumbersome and difficult to use so watch out for that. Conventional wisdom says that cordless devices are easier to use than corded ones, but I’ll tell you that’s not always the case. If there’s no battery-level indicator or it takes too long to charge, a cordless device can be a hindrance. One of the most important things to look at when it comes to ease of use is the controls. Are they positioned well? Are they easy to press? Can you press them by accident? These are all questions you need to ask before buying an immersion blender. Since you’ll be holding this thing on your own while using it – sometimes for quite a while – you do want it to be on the lighter side. If it’s too huge, cumbersome and weighty, you’ll probably have some trouble using it. Try to find one that’s small and light enough, but don’t get something underpowered because of that. Do you know what’s better than an immersion blender? An immersion blender with extra stuff! Let me be clear – you should never get a blender purely for the extras included with it. That’s a waste of money. But, if you find a decent blender that comes with great extras, it might beat out a slightly better blender that comes with nothing. Also, try to pick something that has useful extras – you probably don’t need things like carrying bags or replacement cords. The first thing you’ll notice about this immersion blender is the sleek design. It’s quite easy to hold and lightweight, so you’ll have no problems using it. Storing it is not a chore either. It does have a cord, but it doesn’t get in the way, and it’s quite long. It’s also easy to clean since it’s completely dishwasher safe, so you don’t have to spend time washing it by hand after the job is done. For the price, it’s quite a nice, convenient machine. While this blender is convenient, the problem is that it takes a while for it to blend anything. The 200W motor doesn’t cut it, and it just seems to be a bit underpowered, even on the high setting. About that – it also only has two power settings and not a whole lot else going for it. The whist attachment is great, but beyond that, this isn’t a versatile hand blender. It’s a good budget option for sure, and it does well with smaller jobs, but for anything more challenging, you’ll need something stronger. Clearly, this is one of the most versatile immersion blenders available right now. With its 8 speed settings (plus a turbo setting) and two great additional attachments, it can do almost anything you want. The motor is only 250 watts, but you wouldn’t notice it – it performs like it’s far stronger than that. It’s also lightweight and easy to hold. The milk frother attachment is amazing, and it works well on the lowest speed. Here’s the issue though – it shakes a bit too much even then. If you’re trying to use it in smaller cups, I wouldn’t recommend it since it will be difficult to do so without spilling everything. The motor also has a tendency to overheat, which is never a good sign in my book. However, I still think it’s a good product and one of the most versatile ones around. This is certainly one of the most affordable immersion blenders on the market. You might have your doubts about it because of that, but it’s a decent machine. For starters, it’s got 300 watts of power, which is quite decent, especially for a machine this small. It’s easy to hold and quite compact, so it won’t take up a lot of space in the cabinet. Of course, it’s not without some issues. First off, it doesn’t come with any extras, not even a whisk attachment. The blender itself is all you get. The motor, while relatively strong for the size, does tend to heat up too much when used a lot. If you use it too much, it’ll get too hot to hold, which is not good. Especially when the speed adjustment and shutoff buttons tend to malfunction. I’d say it’s worth a buy if you’re on a budget, despite some shortcomings that it has. If you’re looking for one of the strongest blenders around then this is the one you want. It’s got an exceptionally powerful 700 watt motor inside it, and it works wonders. It’s able to blend almost anything with ease. Despite that, it works quietly, even on top speed. It is quite adjustable too, with six speeds available. It’s well made too, and the construction is quite solid – it seems like it will last for years and it can chop up tough stuff without getting a scratch. However, the strong motor does come with one downside – it makes the handle heavier than it needs to be. It might be a bit difficult to hold. You’ll also have some trouble using it in taller bowls or pots since it’s a bit too short. 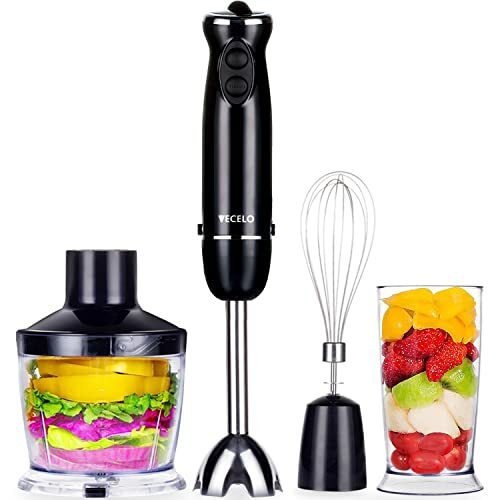 Overall though, this is quite a strong and durable blender for a good price, and it will probably serve you well. 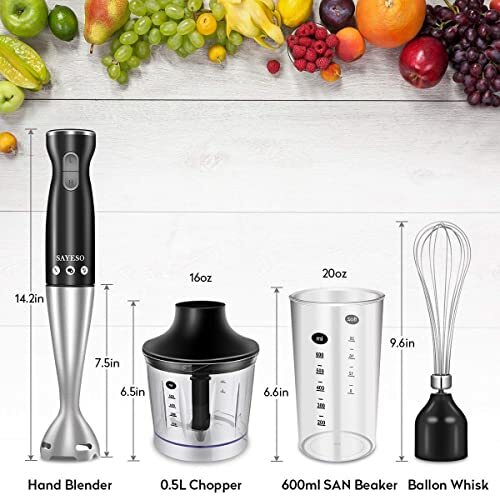 The best thing about this blender is the sheer power it has – with a 500-watt motor, you can be sure that it’s going to blend most things in seconds. It’s far stronger than most others and power-efficient too. It’s also worth mentioning that it’s cheaper than the others and it’s one of the most affordable immersion blends right now. It also comes with a whisk, and both the attachments are dishwasher safe. The main problem with this blender is that it’s just cheaply made. It’s not unlikely that it will be damaged in transport and doesn’t even think about blending anything too hard with it – you’ll probably damage it. That’s probably the reason why the motor chugs and gets stuck sometimes — not a good look to say the least. It is quite a powerful blender for the price, but it will probably break in a matter of months. So, that’s about for now folks! I’ve told you pretty much everything I know, and now I only need to choose the winner. It was difficult this time – I liked a lot of these products, including some that didn’t make the top 5. 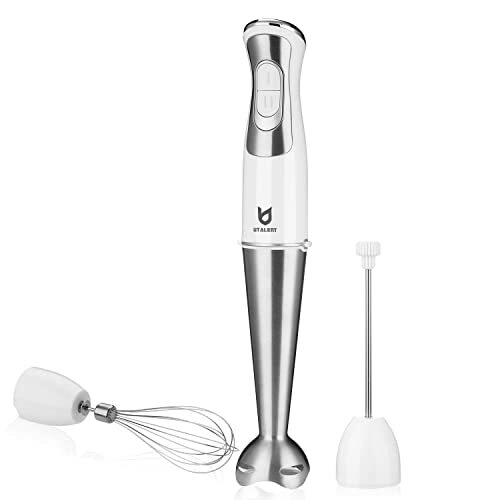 Still, in the end, I think I have to give it to VECELO 700W Premium 4-in-1 Immersion Hand Blender for the simple reason that it’s both strong and versatile. It does have some issue for sure, but they’re easily blown away by all the positives. What do you think? Tell me in the comments as soon as possible; I’d love to hear from you. If you have any questions, I’d also like to answer them.